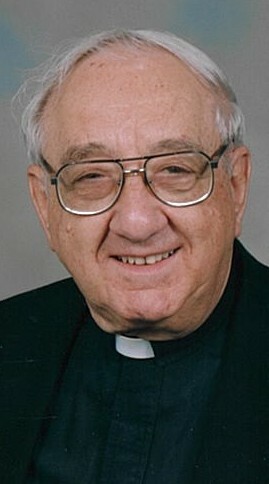 Retired Diocese of Steubenville priest Father Charles E. Mascolino passed away peacefully on Feb. 8 aged 92 years while staying at the Carriage Inn in Steubenville. Born June 30, 1926, in Steubenville, Father Charles is preceded in death by his parents, Anthony and Antonia Tortorice Mascolino; five brothers and two sisters, Salvatore, Joseph, Marina Vincent, Thomas, Father Robert, Mary A Common and James "Bill"; and two nieces and a nephew, Mary M, Joann Swan and Robert Common. Surviving are his sister-in-law, Rosemary of Wintersville; seven nephews and seven nieces, Thomas of Washington DC, Maryann Esser of TX, Joseph of FL, Virginia Harrison of West Lafayette, Raymond VT, Nancy Garcia of FL), Edward Vincent of Columbus, Louis TX, Antonia Garbrick of NC, Elizabeth Parker of FL, Marjorie of UK, Charles NC, Mary Mascolino-Engle of Wintersville, Robert of Cambridge; and many great and great-great nieces and nephews. Father Charles grew up in Steubenville attending St. Peter Grade School and Catholic Central High School. He continued his education at St. Charles Seminary, Columbus; St. John Vianney Seminary, Bloomingdale; St. Gregory Seminary, Cincinnati; and Mount St. Mary of the West, Cincinnati, all in Ohio. Fr Charles was ordained into the priesthood by Bishop John King Mussio in a ceremony held at St Peter Church, Steubenville, on May 29, 1954. Father Mascolino’s first assignment was as an assistant at St. Joseph Parish, Bridgeport, and as a teacher at St. John Central High School, Bellaire. He served at the high school until 1971, and is fondly remembered by many of his past students. While on staff at St. John Central High School, he was also an administrator at Sts. Peter and Paul, Lore City, 1955; pastor at All Saints, Blaine, 1955-63; and procurator, St. John Central High School, 1963. Fr Charles was the founding pastor of St (Mother) Frances Cabrini Parish, Colerain. He ministered there from 1963 until 1978. He was then assigned as pastor of Assumption of the Blessed Virgin Mary, Barnesville. In addition to his responsibilities in Barnsville, in 1981 Father Mascolino became the administrator of St. Mary Parish, Temperanceville. While in Barnesville, he and his parish founded the St Vincent de Paul Society of Barnesville, and working together with local churches of all denominations, established St Vincent of Barnesville Thrift Store and Pantry. As he ministered at parishes, he also served the Knights of Columbus as chaplain in both Martins Ferry and Barnesville, and the diocese on its Senate and Presbyteral Council. He also served as a member of the diocese’s College of Consultors. Father Charles retired from active parish ministry in 1998, and resided in Steubenville. In retirement, Fr Charles continued helping in many area parishes, as well as an active member of the Serra Club, attended conferences at Franciscan University of Steubenville. Visitation will be held at Blessed Sacrament Church, 852 Main Street, Wintersville, OH 43953 on Thursday, 14 February from 3 – 7pm with a Knight of Columbus service being held at 4:00pm, and Friday 9 am until the funeral mass at 11:00am. Burial will follow in Mt. Calvary Cemetery. In lieu of flowers, donations may be made in Fr Charles name to St Vincent of Barnesville, 306 W Main Street, Barnesville, OH 43713 Or St Vincent de Paul, 852 Main Street, Wintersville, OH 43953.